The next cohort is July 1 – August 9, 2019. Registration is open now! ***NEW*** Full Course Access is now available for immediate use on a self-directed basis. Learn more and buy it here! The final cohort of 2019 will be offered October 14 – November 22. Registration will open in early July. 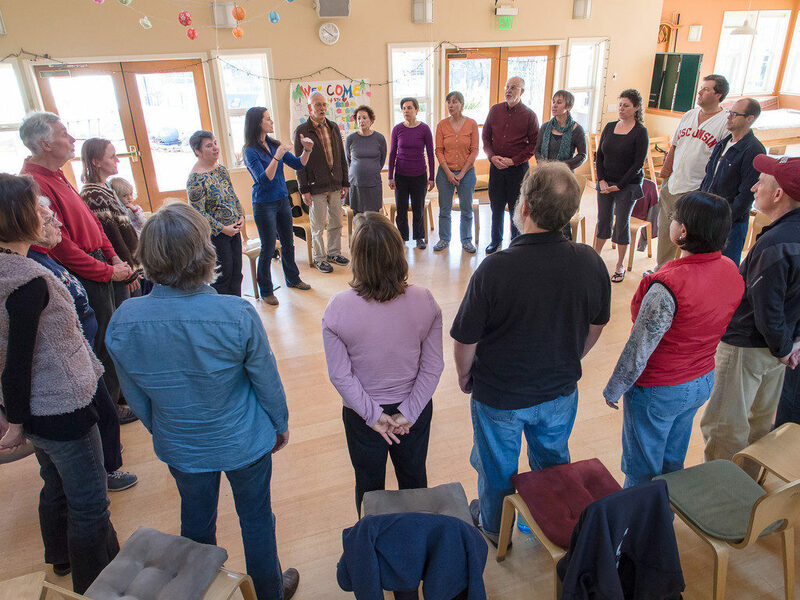 Developed by community singing facilitator Lisa G. Littlebird, this online course offers an accessible but deep dive into the basic skills needed to effectively lead, organize and grow community song circles. The course has been refined based upon student feedback in the previous sold-out cohorts. It is offered over six weeks with a digestible and interactive presentation of the material each weekday. Whether you are an experienced singer with a vision of starting and leading a choir or are new to singing and wish to rapidly grow your confidence singing with others, this course is designed to meet your unique needs. A digestible but comprehensive knowledge base of tools and skills, developed over Lisa’s decade of teaching experience. A library of resources to support your ongoing learning and service in singing, song facilitation, community organizing and business management. A rich network of peers and allies on your path from around the world. The course is now offered in two formats. You may elect to purchase access to the course and use it in an entirely self-directed way, or join an organized and well-supported, interactive cohort. The online course includes lifetime access to more than 10 hours of audio and video content, dozens of articles and other resources to support your development and success as a song leader. Pre-course self-evalution and testing to help identify your goals. Personal goal and milestone tracking, supported by a private Skype or phone session with Lisa. A daily email with a link to that day’s coursework delivered to you each weekday for six weeks. You may complete the class when it best works in your schedule, or choose to augment or skip classes according to your interest. Assigned peer cohorts for interactive study, practice, support and networking. An assigned buddy relationship for accountability, skill development and wisdom sharing. Access to a private Facebook group with the other students and alumni to share resources during the course and beyond. A certificate of completion at the end of the course (not publicly accredited) with Lisa serving as a reference and mentor in your future endeavors. Options to attend in-person trainings. Resources and connections with peers and allies for a lifetime! The structured cohort is recommended, as it provides the structure and support that most students require for successful completion. However the new, self-directed option offers flexibility for those who need the material on a different schedule, are only wanting a portion of the content or are highly self-motivated. Access for those purchasing the self-directed option will be given on January 7, 2019, and you will have lifetime access to the course from that date forward. 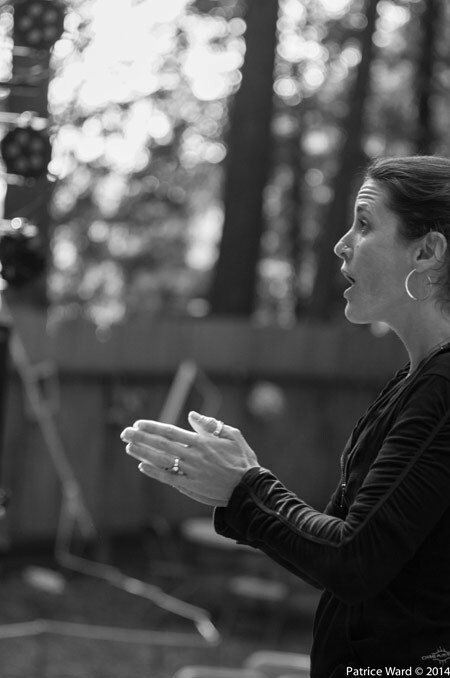 This course is well-rounded in that it addresses the full breadth of skills that Lisa has found to be most useful in successful oral-tradition style song leading. You will likely have some areas of fluency and other areas that are less developed. The course is designed in a self-paced, modular and customizable way, so you can focus more on your personal areas of growth and move quickly through the sections where you already have competence. Each segment includes specific skills and knowledge, Lisa’s personal tips and best practices and a large, living library of musical and professional resources. Of course, the most effective way to become a songleader is to practice! This course is focused not only on skill building, but on supporting you with actionable steps toward creating live practice opportunities. This course presents the equivalent material of a college course. Plan for about an hour each weekday of coursework and study, with additional time for peer and large group calls. No assignments or emails will be distributed on weekends. This class can be used and customized to meet a wide range of goals and experience. There is no grade or final test upon completion, allowing you freedom and ease to self-direct your time and focus. Fully intend to participate for all 6 weeks and complete the course, including your commitments to peers for study support. Budget an average of 1 hour each weekday during the course for study and singing. If you miss a few days it is no problem to catch up on following days or weekends. If you will miss more than a week, it’s possible to catch up in intensive study sessions but perhaps not ideal. You may want to wait until the next offering. Are willing to share your contact information with the students in your peer groups as well as an assigned buddy. We will ask you to actively participate in these relationships during the class. Have regular, reliable access to a computer or tablet with moderate to high-speed internet. Have a basic technology skills, including: the ability to receive and send email attachments, navigate websites with video and audio files and download and install free web conferencing software on your PC or Mac. Have some experience singing in a group in the last year. You need not identify as a confident singer. This course is for anyone willing to develop more skills and confidence. Group live video conferencing will take place at 5:30pm PST on three Thursdays during the course, plus two other times to be announced. Attendance is not required. The calls will be recorded so you can watch them later, but you will miss the opportunity to participate in the live q & a sessions. If you you’re still not sure it’s a fit, email specific questions to Lisa – lisa@thebirdsings.com. Your course fee is fully refundable until the course begins. An in-person retreat will be offered on the Central Coast of California from July 18-21, open to current and past Flight School students. These retreats add much depth and richness to the experience and are highly recommended. The price of this retreat is not included in Flight School. You can reserve your space in it today by registering for Flight School + a $150 retreat deposit. Click here for details about this summer’s retreat. The next will be held in November, 2019. The price for this comprehensive course in the next structured cohort from July 1 – August 9 is $499. If you wish to attend the optional, in-person retreat, that is an additional price (see above.) You can hold your space now by selecting a price that includes a $150 retreat deposit. Access to the course on a self-directed basis is $349. Access will be shared within 24 hours of your purchase. PLEASE NOTE: self-directed access does not include support from Lisa or other students, nor does it include invitations to participate in the in-person retreats. Threshold Choir members receive a $50 discount. Returning students wishing to participate in a structured and supported cohort again can join in for $99. If you would like to arrange a payment plan, please contact Lisa at lisa@thebirdsings.com. A limited number of partial scholarships are available that will be distributed in the two months prior to our next cohort date. Contact lisa@thebirdsings.com with a description of your singing and songleading experience, why you wish to participate, and brief overview of your songleading goals, along with your financial capacity. There are no scholarships offered for self-directed course access. Your purchase is fully refundable until you receive access to the course, after which no refunds are given. Deposits for the in-person retreat are refundable until April 15. Flight School is an amazing tool for anyone wanting to explore the powerful gift of song leading and song sharing. Lisa is a natural leader whose wisdom is communicated with grace and lightheartedness— a big feat in a subject matter that can be very emotional and fraught with vulnerability for many. I'm excited to go out into my community and the world and put my new skills into use! The course is a wealth of tools and information that is new to me, even after more than 15 years of singing circles. 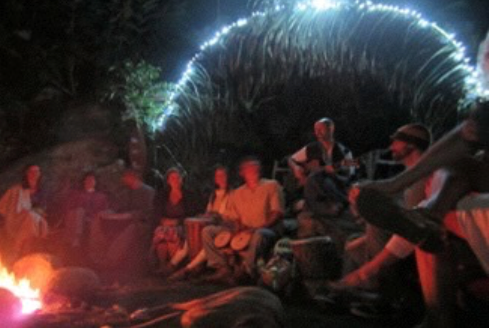 It empowered me to spontaneously lead songs with strangers in unexpected settings (camping and in a restaurant, and with coworkers), and I have heard myself saying that I am a song leader. Many thanks to Lisa's exceptional song leading skills and generosity. It was so much more than I had anticipated. The deliciously rich content feeds my song and I will be digesting it for a long time to come. The quality of Lisa's presentation was mesmerizing... seducing us into deep receptivity. This is beyond a rare opportunity. This is life, joy, song, cultivation of community, offered by one who continually marinates herself in spiritual life and practice. This is for song leaders, singers, and all who wish to let life move through themselves more fully and joyfully. The Littlebird SongLeaders Flight Academy is packed with information in an easy-to-digest format. Lisa's upbeat attitude and support inspired me to practice and know that I can become a song leader and make a positive difference in the world while also having a great time! As a total newbie to song leading, I appreciated the wealth of information Lisa has shared. This information will continue to help me for quite some time. Lisa's supportive, positive and kind spirit shines in all she does. I can't recommend the course enough! Lisa is a warm, inspiring teacher and a multi-media pro who knows how to mix mediums for optimal learning and class cohesion. Whether you're looking to grow your vocal, song writing, community building, business development, or song circle leadership skills, this course provides a rich community of support and a full toolbox to help you build a reality from the blueprints in your heart. Can I take the course if I will be traveling and unavailable some of that time? The course is designed to be self-paced to work with your individual needs. Missing a day or two… even a week is not a problem for most students as you can either skip that week’s material and come back to it or catch up when you return. You will miss some opportunities for connecting with other student and peer groups during time away but can jump back in when you return. If you know will miss more than a week you may want to wait until a future cohort. Whether you stay caught up with the daily assignments or not, know that you will have lifetime access to the course material after the course is complete and can come back to any of it later. 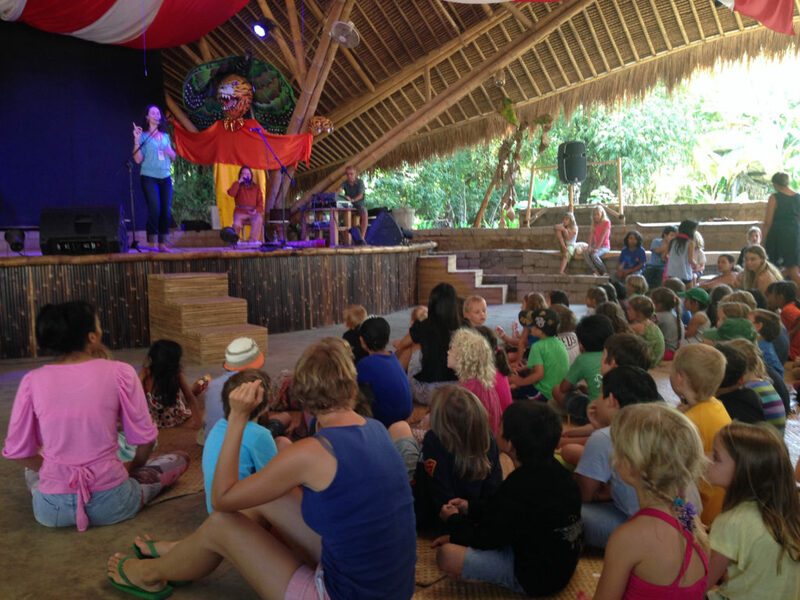 I offer or want to offer songleading primarily for children. Is this course a good fit for me? This course is primarily focused on the skills and repertoire appropriate for songleading with teens and adults, although there will be many areas that cross over and are relevant to working with younger children as well. In this course we will touch briefly upon working with kids and diverse age groups but we will not give it deep focus. It may be best to email your specific questions and intentions to Lisa – lisa@thebirdsings.com – to help determine if this course will be useful for you.